While I usually use granola as a topping for my morning yogurt, this version never saw yogurt... only my spoon. Light, crunchy and with a delicate peanut butter flavor, I found it to be nearly irresistible. Measure rolled oats, flax meal and salt into a medium mixing bowl. Set aside. In a small saucepan, melt the peanut butter and brown sugar with a splash of honey over low heat. Melt just until "mixable" with the dry ingredients. Add the vanilla and stir. Pour the peanut butter over the oats and add the beaten egg white. Stir to coat, then spread evenly onto a silicone mat (or prepared baking sheet) on a baking sheet. Place the pan into the oven and bake for 15 minutes. Stir granola at the 15 minute point, and check for doneness (my oven is not very even, and will bake faster some times than others, new oven is on the Christmas List...). Bake about 10 minutes longer, check and stir again. 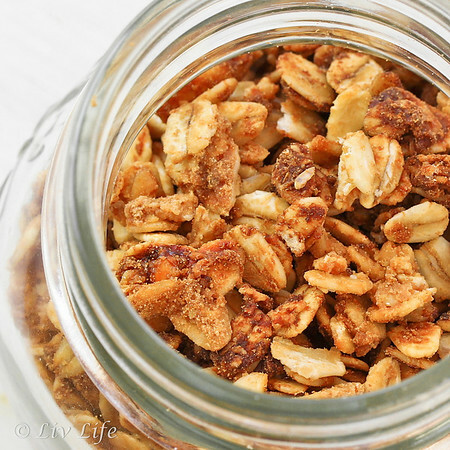 Remove if the granola is golden brown, or continue baking if you prefer your granola darker. Your PB granola looks amazing. this would be a good snack for my hubby, who loves anything PB, and this would be no exception. I'm pinning this one. Anonymous... I am actually not a sweet person, and I loved this granola! Delicate flavors, and no, not too sweet. I did use Jiff peanut butter, but I'm thinking a natural version might lend a bit more "peanutty" flavor? We first tried this with honey only, and even I found that a little extra sweetness would have been welcomed. The girls didn't like the honey only version at all, they all said "More sugar!". Hence, we reverted to the brown sugar. I think if you are not a sweet person (tastewise!) that you would probably be OK with the honey, but I think I would add a touch of brown sugar for a bit of depth and a little more sweetness. Let me know if you try! I would be interested to hear how less sugar does. This granola sounds wonderful! I love peanut butter in my granola! 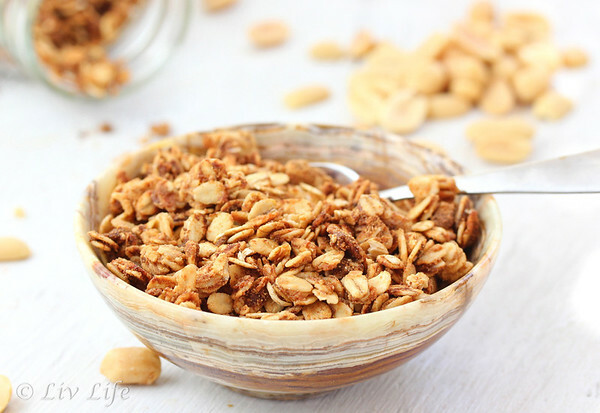 Peanut Butter granola is new to me :) Am not a big fan of granola but its my better half's staple breakfast. Have to try this :) Thanks for the recipe. 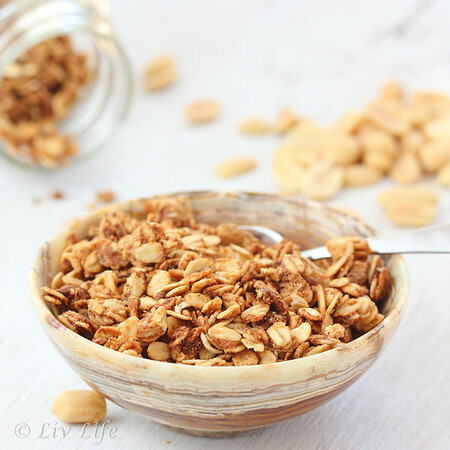 Peanut butter and granola--two of my favorite foods. I'm making this now! This looks SO delicious. Definitely going to be making some. For gift-giving purposes, do you know how long it keeps? Will definitely be making this! May also try subbing the PB with either Nutella or Biscoff spread as an alternative. Oohh!!! I love the idea of the Nutella alternative!!!!! we need develop exra techniques on this regard, thanks for sharing.